Power Tuna Salad - A recipe from Savor California, the online showcase for extraordinary gourmet foods and beverages from California. Heat the olive oil in a small pan and add the cooked chickpeas. Sauté until golden brown and chewy. 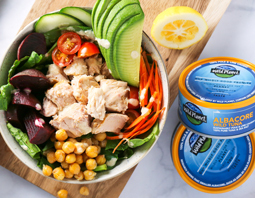 Place greens in two bowls and top equally with Wild Planet Albacore Wild Tuna and sautéed chickpeas. Add the rest of your veggies. In a small bowl, whisk together the tahini, lemon juice and water until smooth. Add in salt and pepper to taste and drizzle onto salads.